Spring is approaching and it’s about that time to start thinking about the outdoors and outdoor fireplace ideas. When it comes to outdoor spaces design it’s always best to consult with an experienced and trusted landscaping company. 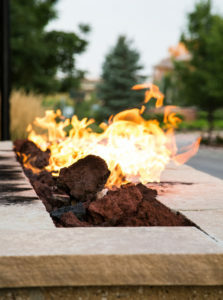 Outdoor living space landscape designers, also known to you as Stefanos Landscapers can set you up with anything from a beautiful outdoor kitchen landscape design to a one of a kind custom outdoor fireplace. Our focus for this article is outdoor fireplace ideas. Custom Fireplace Build or Modular? style that is perfect for your yard. Modular fireplaces are pre-built in a factory, shipped in sections, and installed with a pallet loader. The biggest benefit of going with a modular fireplace is lower installation costs and a faster construction time. An important consideration that dictates location is whether you choose a wood burning or gas burning fireplace. Generally, gas-burning fireplaces have fewer restrictions and can usually be placed anywhere in a design – even directly against another structure. Wood-burning fireplaces usually need to be placed at least 10 feet from another structure. A local landscaping company will be familiar with the building codes and can let you know your options. Nothing makes a grand and cozy design for your outdoor fireplace like a stone façade. Stone is timeless, it was what the first fireplaces were made from. Concrete retaining walls are a fantastic choice as well because they mimic the look and feel of natural stone. A classic brick fireplace with an extending hearth is the classic fireplace look that everyone loves. Surround it with cozy furniture and add plants and boxwood shrubs to bring the area to life. A traditional fireplace is a surefire winner.